Synopsis: A great stone funeral barge moves through space, its course set for a fateful rendezvous. Venturing aboard, the Doctor and Alison find that this floating tomb serves as the resting place of Sebek, an ancient and powerful Osiran. 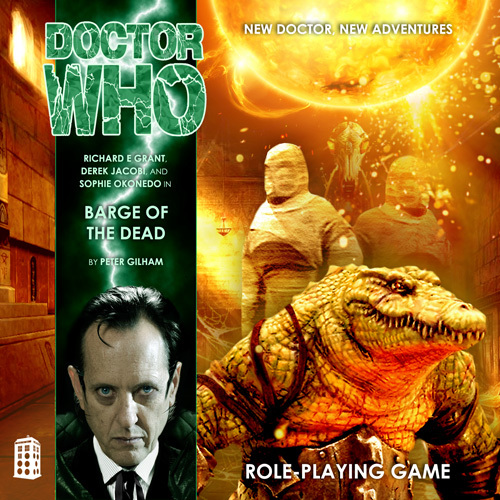 Though the Doctor is relieved to know that the infamously savage crocodile god has long since passed on, he soon realizes that their presence has returned life to this previously dormant crypt. Mechanical scarabs scuttle in shadows, crocodilian warriors rise from stasis, and servicer robots resume their patrols of the stone labyrinths. When Alison encounters a gang of tomb raiders in the depths of the ship’s vast treasure vaults, an unpredictable new element is added to an already volatile mix. Some of these scavengers are after more than mere riches, breaking down the walls that divide the living and the dead. In the throne room, a colossal corpse stirs. Sebek the Rager—God of Crocodiles, Pointed of Teeth, the Strength of the Pharaohs—has been reborn! This entry was posted on 16/12/2015 by hedgewick. 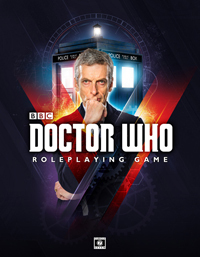 It was filed under The Nth Doctor and was tagged with Alison, Barge of the Dead, Episodes, The Master. Sounds like a great game. Awesome idea using the Osirans too. I’d love to know how this turned out. It was a great game, Tim. The villain and his connections to the Osirans were all laid out in the original module used for the game, misterharry’s “The Ship of Death.” As a result, our solution to the crisis was inspired by “The Pyramids of Mars” too, as Sebek was persuaded to enter a space-time tunnel and trapped in a chamber beneath the martian pyramids. It was an exciting adventure, and we all had a great time.